MU encourages ALL students to complete the confidential AAU Campus Climate Survey on Sexual Assault and Sexual Misconduct. 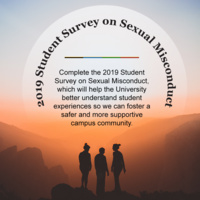 The survey results will help us determine the prevalence of sexual assault and misconduct on campus, gauge student views regarding the campus climate on these issues, and assess student knowledge of available resources. A randomly selected sample of 6,000 students will receive a $5 Amazon gift card upon completion of the survey, while others will be automatically entered into a sweepstakes to win one of three $500 VISA gift cards when accessing the survey website. Look for emails from “2019 Campus Climate Survey” from April 3-May 3 for your opportunity to contribute to a safer Mizzou.